22.5'' high, 10'' wide, and 9'' thick. This fragment has two panels. There is a line of inscription at the top, and another line of inscription separating the two panels. The top panel represents the Wedding Feast at Cana, New Testament, John 2. There are water-pots in the fore-ground, and three figures standing just behind them. 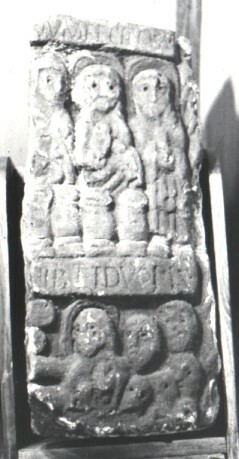 The figure in the centre is Christ, who is holding a scroll in his left hand. He blesses the water-pots with his right hand. Mary is on the left (Christ's right) and is whispering to Him. Saint John is on the right, with one hand against his cheek in a gesture of wonderment. The lower panel depicts the miracle of the five loaves and two fishes, New Testament, Matt 14:17, Mark 6:35, Luke 9:12, John 6:5. The loaves are on the left of the scene. Christ is in the centre, and extends his right hand to bless them. The multitude are represented by a number of heads which fill up the right side of the panel.